Khaosan Road in Bangkok was the next stop for the Chao Phraya Tourist Boat and if you have never been to Khaosan Road you should add this place to your Bangkok travel itinerary, so you can see for yourself what it is all about. This tale continues from a previous page describing how we took the Chao Phraya River cruise from the pier at Saphan Taksin BTS station, so make sure you read that first. This is the last stop and once the boat stops at Pier 13, alight from the boat walk through the alleyway until you get to the road. 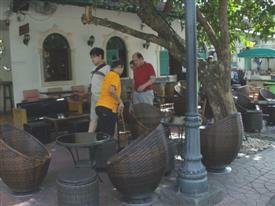 Then take a left until you get to Santichaiprakarn Park on the left where you will see the historic Phra Sumane Fort. The fort was built in 1782 as one of 14 forts along the Bangkok city limits to protect Bangkok. 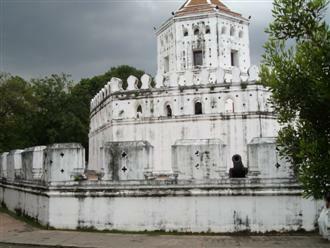 Only two such forts still remain in Bangkok and it is a very distinctive design. You can spend 10 minutes or so here walking through the park alongside the Chao Phraya River and then go past the fort before returning to the main road. Continue in the same direction along Phra Arthit road until you reach the large intersection with the traffic lights. Notice the distinctive design of the shop houses in Phra Arthit road, they have the wooden bi-fold doors from a period long gone. At the traffic lights you need to take a right, but first cross the road in front of you and then cross again at the traffic lights to your right. This will put you on the side of the road that has the market stalls set up. As you walk along the pavement gradually market stalls start to appear and before long the stalls encompass both the left and right sides of the pavement leaving only a small gap down the middle for pedestrians to pass through. 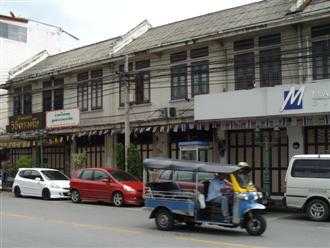 Inside the building on your left is the Banglamphu Market, a great place to spend some time looking at the stalls. 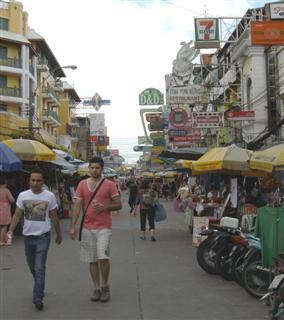 Take your time to wander along the street leading to Khaosan Road, all the while looking at the different foods for sale. Cross the first side street you reach and if you are hungry by now and feel like some noodles, stop and place your order at the small cart in front of the internet cafe. 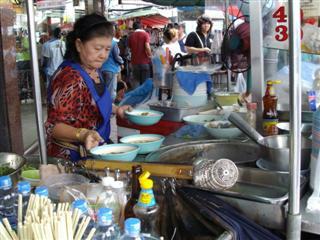 Take your pick of some noodle soup or rard na and take a seat in the street. Don't forget to pay once you have finished, then continue on your way until you reach the large temple on the right hand side. 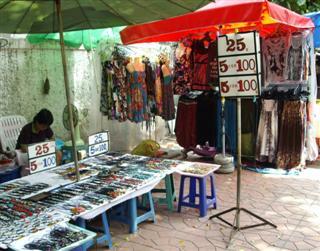 Cross the road and go down the pedestrian mall that runs alongside the temple known as Wat Chanasonkhram. Along this pedestrian precinct you will find coffee shops, small restaurants and bars and cheap places to stay. Even though this is a pedestrian mall motorbikes will whiz by you, sometimes unnervingly close by and always very fast. Always walk carefully in Bangkok and in a steady fashion and if you do have to make a change of direction then always look behind you as there could be a motorcycle riding on the pavement. Continue walking along the pedestrian mall and make a left at the end; you will see that it follows the perimeter of Wat Chanasonkhram. Continue walking and make another left, so now you are walking back on yourself heading in the direction of the main road. In this last stretch you will notice that you have left a lot of the tourist type establishments behind. You may find Thais all clustered around a television set cheering on the sport or sitting down drinking whiskey. On your right you will pass a Muay Thai boxing ring and the path will appear to come to a dead end. But don’t give up, don’t turn around and go back, just keep on going. If you look carefully you will see a set of stairs in front of you and a sign indicating that you can pass through the building back onto the main street. Go up the stairs and through the back packer building and then down the stairs again to the street. Have a cup of coffee if you wish and take a rest. Here is a Google Map of where you have been and where you are going next. Turn left as you reach the street and continue for about 50 m. On your right will see another pedestrian precinct. This is Khaosan Road; the one and only. 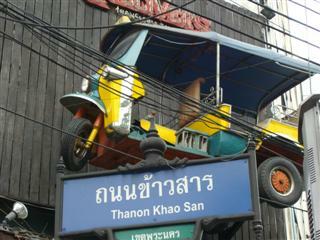 If you like taking photographs around Bangkok then look out for the Khaosan Road street sign and also the tuk-tuk embedded in the wall above eye level. A tuk-tuk is basically a motorised rickshaw, there are very few places that you can still see hand drawn rickshaws in the world. You can still see bicycle rickshaws if you visit Surin city centre in the North East of Thailand, Nakhon Ratchasima to the North, or even in Hua Hin to the South of Bangkok. It would seem that you have to be at least 70 years old to pedal one of these things. Bang Pu seaside resort has one of these old style rickshaws on display. 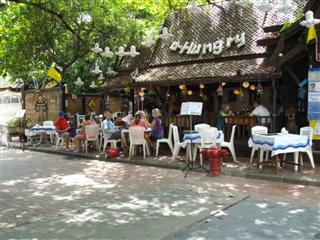 Take your time and walk along Khaosan Road taking in the atmosphere. It is a mix of market stalls selling flip flops, tourist hats and croaking frogs and service businesses like massage shops, bars and restaurants. There are also tailors along this road, so if you feel like buying a suit then you can get yourself fitted out in a lovely pinstripe. You can even get hair braiding done on the street or get that very special tattoo to show off to your mother. If you are into body art, then there is a big shop full of titanium bolts that you can put through your lip or eyebrow, just so you can set the body scanner alarm off at Bangkok airport on your way out of the country. Khaosan Road is a tourist Mecca and you are paying tourist prices for most things on display, but it is really popular and it has a great atmosphere about it so I can see why it holds an attraction for so many people. Khaosan Road may seem cheap compared to your home country but anything you buy is probably double the normal Bangkok prices. Walk along the street until you reach the end and turn around and start to walk back. Keep looking out on your right hand side for a small alleyway. Take either the first or second alleyway and pass through to the small street on the other side. When you reach the street take a left turn and continue walking. This street has some light traffic so try and keep to the pavement to avoid getting knocked over. Walk further on until you reach the main road, but check out all the accommodation, eating places and things on offer, as you go. At the main road, you will find yourself again at Wat Chanasonkhram and opposite the pedestrian mall that you first went down. If you have time, make a visit to the temple, but if not then take a right and head back to the Chao Phraya Tourist Boat ferry retracing your steps through the street market and to the traffic lights and back past the fort. 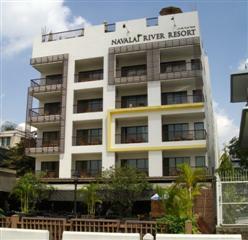 You should now be ready to continue your river cruise in Bangkok. The last boat leaves from the Phra Arthit pier at 3:30 pm, but don't worry if you have missed it, you can just hop on the next public ferry boat that comes along. When you get on the boat, just hold your Chao Phraya Tourist Boat tickets so they are visible and the lady collecting the fares will walk by. This is exactly what I did, but instead of getting off at China Town we got off at Pier 6 by mistake and had to take a tuk-tuk to China Town. 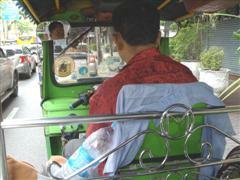 The tuk-tuk ride was quoted at 100 baht but we offered 80 baht and then set off. It was worth it as it was definitely too far to walk to the China Town pier. The ride in the Bangkok tuk-tuk had us weaving through some small roads where there were flower sellers and street markets set up. On some of the roads the traffic was grid locked and the driver had to go down the back streets that were too narrow for a car. The tuk-tuk driver dropped us back at Pier 5 and from there we headed back to Central Pier to take the BTS back home. 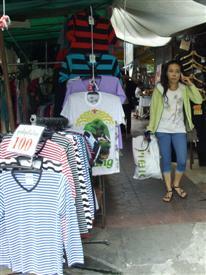 It had been a busy but enjoyable day and we got to see a side of Bangkok that we had not experienced before. Of course we didn't even scratch the surface of the things to see and it gave me a lot of ideas for a future Bangkok vacation based solely around the Chao Phraya River. I had an idea that the river cruise in Bangkok could be expanded so much more and that there are endless possibilities when planning out a trip like this. Another trip up the Chao Phraya River on these tourist boats concluded with a walk around Nonthaburi.